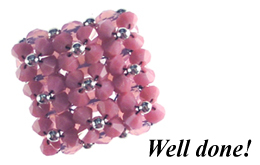 YOU WILL NEED: A cutter, 0.25 color-coated tigertail wire, 47 x 4mm round Swarovski crystal beads, 36 x 4mm Swarovski crystal beads, 21 x 2mm metal beads. Cut a piece of wire of approximately 60 inches long. 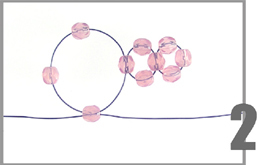 Thread 3 x 4mm beads onto the middle of the wire. Thread the wire from opposite sides through another 4mm bead. Pull the wire gently. Thread 1 x 4mm bead onto each side of the wire. Thread the wire from opposite sides through another 4mm bead. Pull the wire gently. Thread 2 x 4mm beads onto one side of the wire. Thread the wire from opposite sides through another 4mm bead. Pull the wire gently. 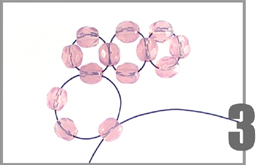 Thread 2 x 4mm beads onto the outer wire. Thread the wire from opposite sides through another 4mm bead. Pull the wire gently. Thread 2 x 4mm beads onto the inner wire from the left. Thread the wire from opposite sides through another 4mm bead. Pull the wire gently. 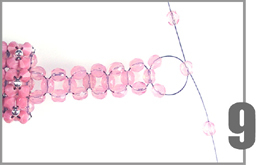 Thread the inner wire through the bead on the left ( 1 x 4mm bead). Thread the wire from opposite sides through another 4mm bead. Pull the wire gently. Repeat numbers 3 to 5 again in order to make another row. Thread 1 x 4mm bead onto each wire. 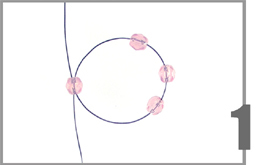 Thread the wire from opposite sides through 1 x 2mm metal bead. Pull the wire gently. 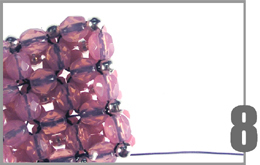 Thread 1 x 3mm bead onto each wire. Thread both wires in opposite directions through the 4mm bead opposite the glass bead through which the wires were just threaded; this makes a flower. Repeat number 6 in order to make 9 flowers. 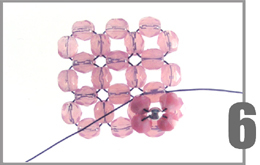 You can run the wire through a row of 4mm beads in order to get to the other side. 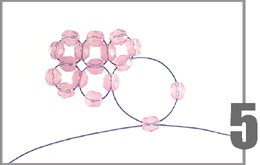 You can run the wire through the frame of 4mm beads and thread a metal bead between each 4mm bead in order strengthen the ring, as well as decorate it. Thread 1 x 4mm bead onto each wire. Thread the wire from opposite sides through another 4mm bead. 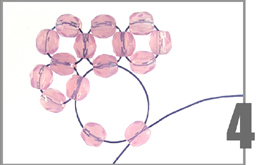 Repeat these steps 7 times, whereas at the end instead of using a new 4mm bead, thread both wires in opposite directions through the 4mm bead opposite the bead through which the wires were just threaded. 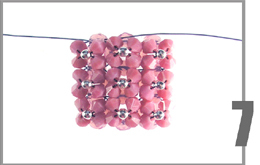 Run the excess wire through all the glass beads until the one side meets the other side. Tie them together well. Cut off the excess wire.